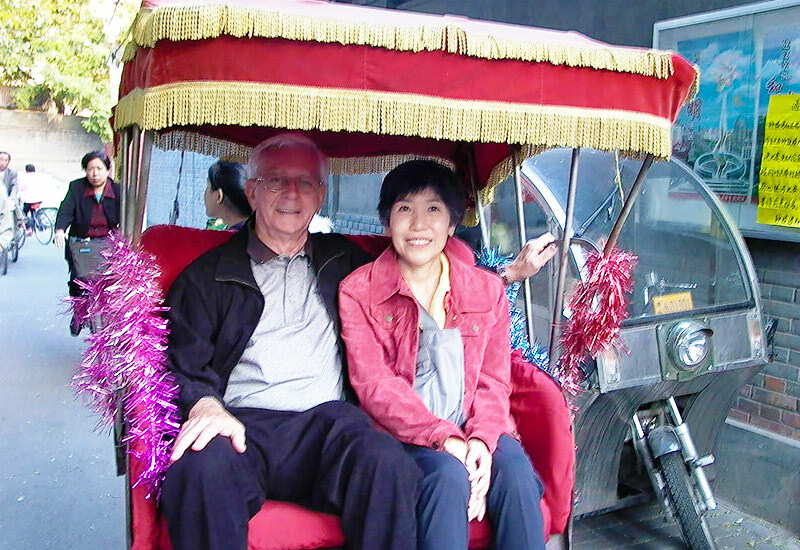 This year, in 2017, Odyssey arranged a tour to China for a special American client, Mr. George Eifler, the very first client of Odyssey. Apart from his trip to some fantastic places, he also paid a visit to the office of Odyssey in Guilin. What made him decide to meet his travel companion in person? The answer lies in the lifetime relationship between George and Odyssey. 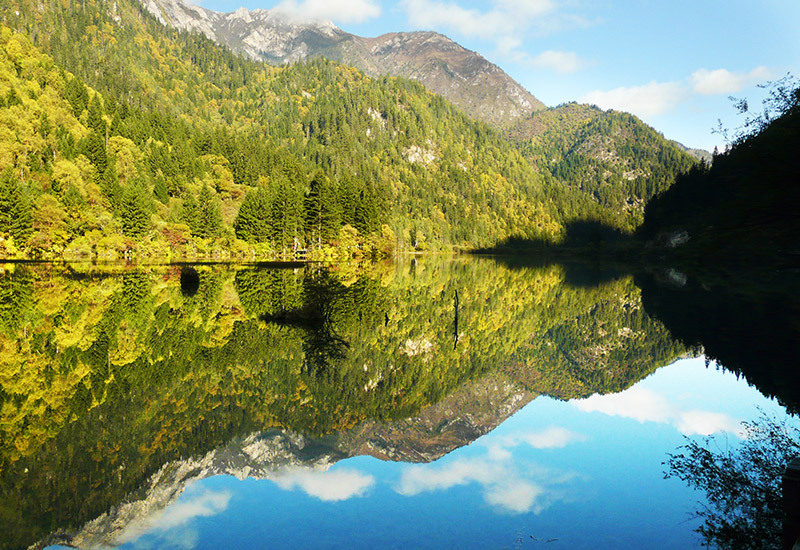 The story dates back to 2004, when George and his wife Cheh were searching for a reliable travel companion for a trip to China. He sent inquiries to different tour operators, and found out that Odyssey was the fastest one to respond with professionalism. So they decided to let Odyssey handle their trip. Everything went smoothly, but one thing kept bearing in George's mind constantly was that he missed his Chinese old friend Mr. Kan. So he sent an email to the president of Odyssey, Mr. Michael Zhou, looking for his assistance to find the contact information for Mr. Kan. The only clue was the name of the company that Mr. Kan was working in the last contact with him. 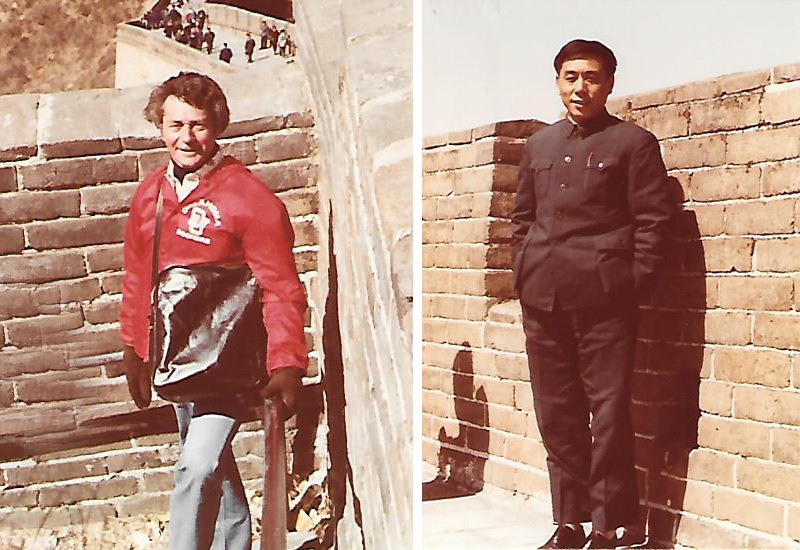 Mr. Kan was the Chinese interpreter for George when his company sent him to China for a business trip back in 1980. George developed a private friendship with Kan by talking about personal issues like family, income, living conditions, etc. They still had contact after George returned to America, but due to changes in jobs, they somehow lost contact. However, the flame of their friendship never quenched. George sent the request with little hope of success because he knew it was absurd. How could someone find a person in over 1 billion people with a piece of 23-year-old information? He didn't expect much except for a polite response from Michael telling him they didn't find Mr. Kan. However, when Odyssey staffs received the request, they didn't give up hope. Instead, they could feel how George missed his old friend. So they decided to try their best to help him find Mr. Kan. They kept making phone calls to institutes and companies that may be relevant to George's old friend, and finally Michael obtained the information that Mr. Kan's wife was with a ministry as a retired staff. 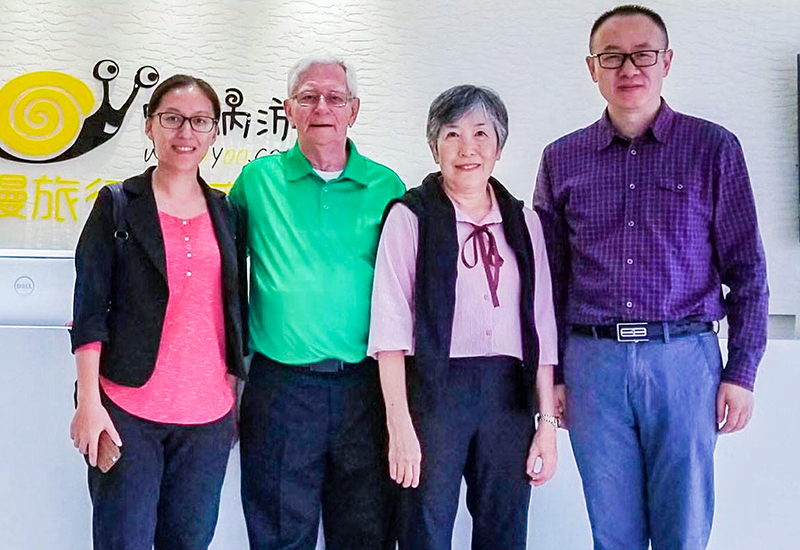 "I almost fell from the chair with gratefulness when I received an email from my travel consultant, Joyce Chen, telling me they had found Mr. Kan's email address and phone number," said George. The two old friends were finally able to hold their hands after 25 years, and George spent a whole day with Mr. Kan and his family to memorialize the old days. "Since then, Michael instantly became a Chinese hero to me," said George, "He had demonstrated that Odyssey could even handle the most outlandish requests." 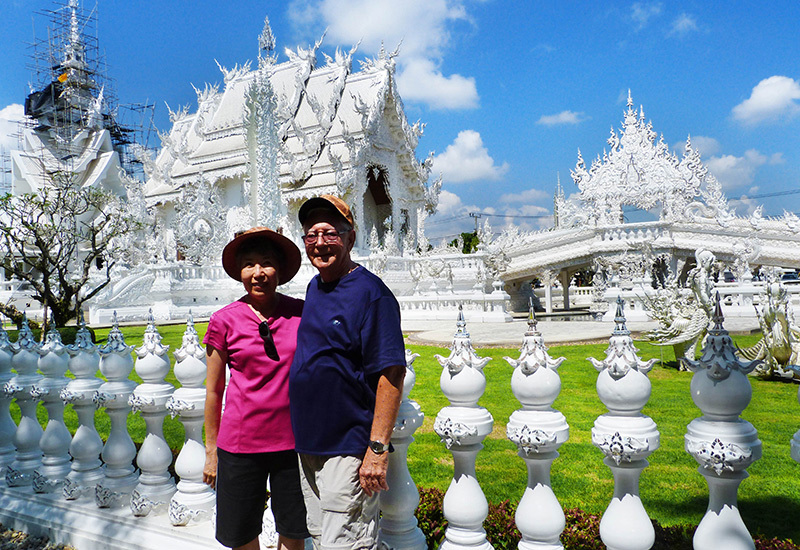 The trip went quite well, and the couple found the travel guides and drivers selected by Odyssey were most helpful, friendly, and they cared much about their safety. 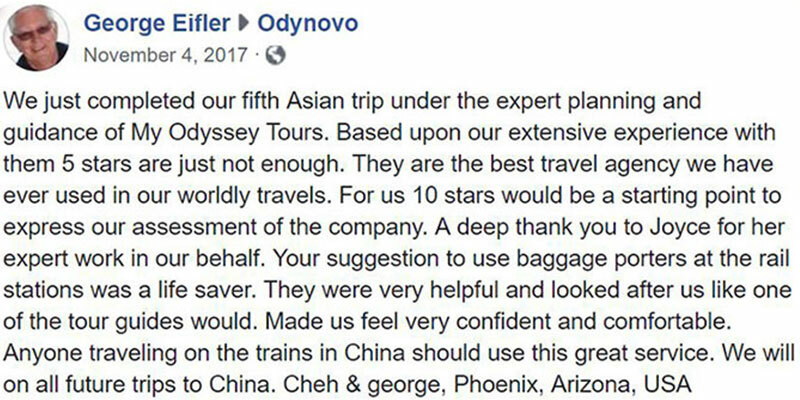 The professionalism, trustworthiness, and responsibility that Odyssey showed during the journey and the attitude of paying attention to customers' every need won George's trust at the very first trip that he traveled with Odyssey. Over the next decade, George and his beloved wife traveled to China, Korea and Thailand, and Odyssey had been their faithful companion on the road, making every trip most trouble-free.  They considered Odyssey as a great partner that had enriched their life. 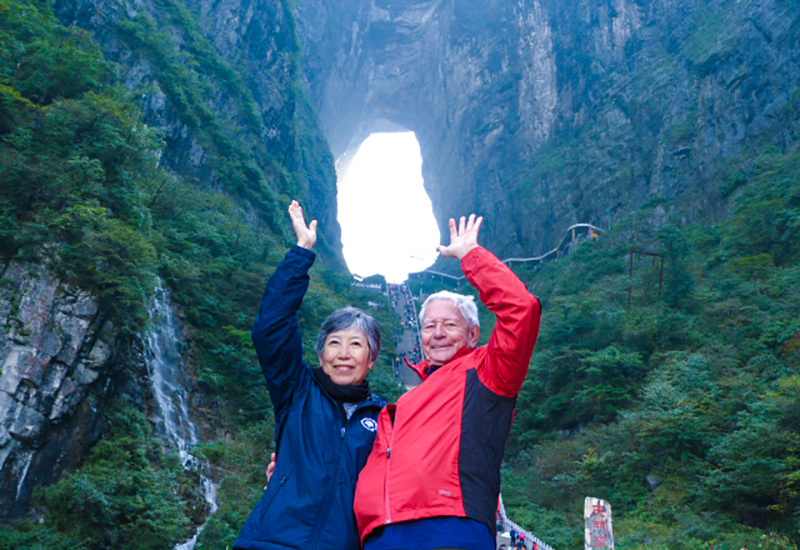 In 2015, after learning about some scenic areas of China through the internet, George and Cheh got the impetus to travel back to China again, heading for Danxia Landform (Rainbow Mountain), Dongchuan and Zhangjiajie. They also planned to visit intriguing and interesting cities like Shanghai, Lijiang, Kunming and Chengdu, and more, experiencing some authentic local life by walking the streets and talking to people, as well as seeing the changes over these years. Everything was ready when George found himself got with a health problem and needed a surgery, so his body didn't allow him to set out for the trip. Though disappointed, George had to postpone it. After learning about the situation, Michael, the president of Odyssey, decided to give back the deposit to George. And at the same time George would still keep in touch with Odyssey even during the recovery period, telling us how he's getting better and better. Almost as soon as he recovered, George took on the trip again. The trip went well as usual under the service of the guides and drivers, but something happened in the old train station in Lanzhou. Carrying with 20 KG suitcases, the elderly couple was not able to climb the 30+ steps. Then a call from their travel consultant, Joyce, came asking how the trip was going. Learning of the luggage weight problem, Joyce came up with the idea of making arrangements for a porter to help the couple with the luggage when getting on and off the trains. George's wife, Cheh, was so relieved with the suggestion, and felt much happier after the arrangement was implemented. Also, instead of just communicating on the phone and through emails, this time George decided to meet his lifetime travel companions in person, to show his respect and appreciation for always being a reliable companion along the trips. 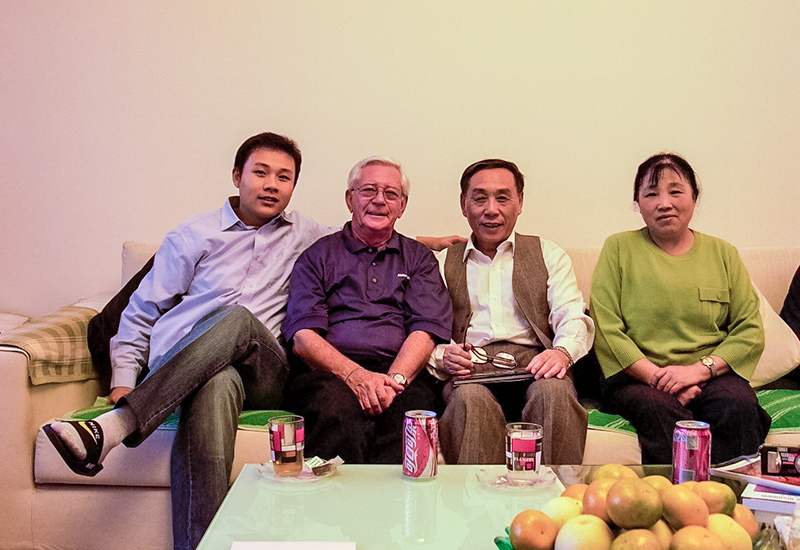 So he and his wife came to Odyssey's office in Guilin, meeting with Michael and they were invited to enjoy dinner with Candy (vice president of Odyssey) and Joyce at Michael's home, to memorialize the stories they had together over the years, and saying farewell to his lifetime friends on the road. So affectionate is George that even separated by the vast Pacific Ocean, the connection between George and Odyssey has never been broken. And the relationship grows stronger and stronger as George went on trip after trip with Odyssey. Just like Michael said, "The road is long but it never blocks friendship." And the initial trusts from clients like George are invaluable, Odyssey considers its clients as more than just guests, but also lifetime friends that it would keep faithful to, assuring that "You are not alone with Odyssey."